Research on stem cells, is currently a rapidly growing trend in the world of science. In the medical world, this is known as a stem cell treatment from toe to head. Utilization is very spacious and relatively safe for the treatment because it comes from biological material which comes directly from the patient's body. Currently the treatment with stem cells has been applied to heart disease, diabetes, orthopedics and even beauty. Stem cells are undifferentiated cells into specific cell types that can be developed into many different cell types to repair and replace damaged cells. Many stem cells are found in bone marrow and umbilical cord. One of the researchers from the Center for Primate Studies (PSSP), IPB University (IPB) utilizes stem cells for anti-aging. 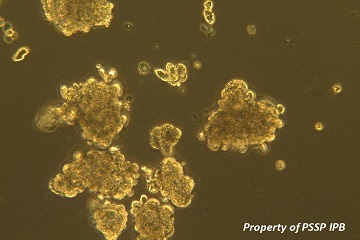 Since 2008, the USDP began research on stem cells in primate species. Primate species have biological characteristics, physiological and closest kinship with humans. "So we took the stem cells from the umbilical cord of human and animal models injected into mice that have been aging. Then the rats examined whether the injection can overcome aging features such as the decline of memory, motor skills down or weak and others, "said Dr. Berry Juliandi as a guest speaker in a One Day Seminar on "Stem Cell Research" at the IPB campus Baranangsiang, Bogor (30/1). According to the lecturer in the Department of Biology, Faculty of Mathematics and Natural Sciences (MIPA) IPB, the injection of stem cells in old mice were able to be anti-aging. Memory and motor of the rats improved. Meanwhile, other speakers in attendance namely Dr. Mariya silmi as the Head of the Biomedical Program PSSP say that animal experimentation is crucial to improving human health through basic and applied biomedical research. Primate stem cells can be used as an in vitro model for the study of which can not be done in humans because of limited practical or ethical. Or can not be done on rodents because of differences in physiology and anatomy. Use of the primate species to stem cell research should not be done as the primary study, but can only use waste from other studies. "Animals primates has similarity in anatomy and physiology. Infectious diseases, through menopause, the similarity in the profile of chronic diseases, mating system and its environment can be controlled. Primate species are widely used in the biomedical field is a long-tailed monkeys, Long-tailed / cynomolgous macaques (Macaca fascicularis), monkey, pigtailed macaques (M. nemestrina), Rhesus macaques (M. mulatta), African Monkeys (Baboons and vervets) New World monkeys (Squirrel monkeys, Owl monkeys, Tamarins, Marmosets), Apes (Chimpanzee), "he said. Other speakers present were Prof. Elena Cattaneo, Director of the Laboratory of Stem Cell Biology and Pharmacology neurodegenerative diseases, Stem Cell Research Center of the University of Milano. Prof. Elena describes Neurons from Human Pluripotent Stem Cells for the treatment of Huntington's disease (a neurodegenerative condition of the brain caused by prolonged channel CAG), Research and Experimental Transplantation.